OxyCure Type A is designed for those with a busy lifestyle and less personal free time. It can be used at home after a long day. Also it is useful for GP practices, beauty salons, alternative medicine practices, hotels, or companies which like to provide special value added treatments to their employees. All OxyCure treatments begin with the same steps. After signing the agreement of use the medical representative will gauge your actual partial oxygen level in your blood. 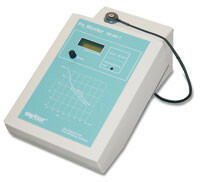 He or she will use the Oxygen Partial Monitor TM300T, a high-end top device, based on the latest technology. It will not harm or injure your skin, the measuring sensor will be placed on your lower arm and will become a bit warm. The process itself will take a couple of minutes. This value indicates the readily available oxygen for every single cell in your body. In other words your actual energy level. Remember, more oxygen means every single cell in your body is able to process more nutrients in order to gain more energy. It is important to prepare your body to accept the more available oxygen. This specially formulated drink contains substances like nutrients and vitamins which are known to improve the acceptance of oxygen in the body. OxyCure Type A means that you will breathe in IONIZED oxygen for 30 minutes 10 times in one month. 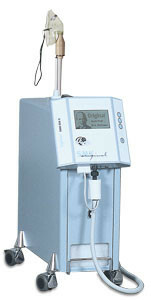 This procedure ensures the highest effect of the treatment. Most of us have experienced the fresh clean air and the nice easy breathing just after a thunderstorm with lots of lightning. The reason is pure physics. The lightning with thousands of volts ionizes the oxygen molecules in the air. These special oxygen molecules are mostly charged negative and much more biologically active. This well known effect is used by our Oxygen Concentrator 5000 IONs to shorten the time of inhalation. Our Oxygen Concentrator 5000 IONs do not use oxygen bottles, it concentrates oxygen from the ambient air up to 95%, filters it and prepares it for inhalation. The output of the inbuild Ionisator is approx. 5 million ionized oxygen molecules per c.c. a light body movement and or reading to improve the blood circulation is highly recommended, but of course up to you.